Hot on the wheels of this week’s Tour de Yorkshire, we have a 15-strong team of riders saddling up for the Great Yorkshire Bike Ride in a bid to raise £10,000 for lots of deserving charities. We think our Chairman, Peter Wilby, is deserving of a yellow jersey as he gears up for his 23rd Great Yorkshire bike ride! And this year he’ll be joined by his son and our Managing Director, Ryan Wilby, as they take on the annual 70 mile ride across Yorkshire. Thirteen other riders who either work at Caravan Guard or have links to the company, are in the team, and together they’ve pledged to raise a massive £10,000. 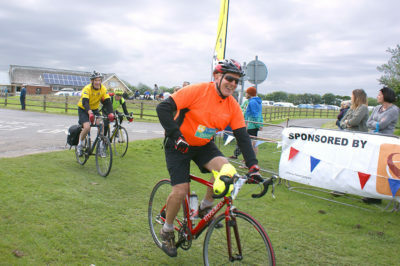 The sponsored cycle ride starts in Wetherby, West Yorkshire, and finishes a gruelling 70 miles later on the North Yorkshire coast in Filey. Caravan Guard has entered a team for the last five years and has raised more than £30,000 in this time. Here’s a video looking back at last year’s charity bike ride, captured by our regular team rider and Head of Accounts, Graham Dobson. This year, they’re hoping to smash their £10k sponsorship target, which will see cash going to a number of Yorkshire-based charities, including Heart Research UK and Yorkshire Cancer Research. Peter hopes companies and individuals will really get behind his team. Over its history the Great Yorkshire Bike Ride has raised almost £3 million for Yorkshire charities including Epilepsy Research UK, Candlelighters Trust, Martin House Children’s Hospice and St. John Ambulance. If you would like to get behind the team and sponsor simply visit uk.virginmoneygiving.com/team/GYBR17 to donate online.